Primary thallus: squamulose, persistent; squamules: up to 2 cm long and 1 cm wide, subentire to broadly crenate-lobate, occasionally accessory lobules along margins, edges upturned; undersides: whitish to ochraceous yellow at base, esorediate but lobules occasionally sorediate podetia: 30-120 mm tall, usually unbranched, greenish yellow, some tips subulate or throughly split (longitudinal slits on podetial walls), most tips cup-bearing; cups: 1-8 mm wide, with radiating openings interiorally and many short, blunt proliferations from margins surface: with corticate base in young podetia but almost entirely farinose sorediate or with a few patches of verruculae or numerous squamules (some of which approach the size of primary squamules) in older podetia Apothecia: infrequent, up to 3 mm wide, red ascospores: oblong, 8-10 x 2.5-3.5 mm Pycnidia: common, at cup margins, with red gelatin conidia: 8-11 x 1 micro meter Spot tests: K-, C-, KC- or yellowish, P-, UV+ Secondary metabolites: thallus with usnic and squamatic acids, accessory bellidiflorin; apothecial discs with rhodocladonic acid as a red pigment. Habitat and ecology: on rotting wood or acid humus in timberline woods, mainly in cold temperate regions World distribution: Antarctica, Asia, Europe, North America and South America (southern portion) Sonoran distribution: eastern and northern Arizona. Notes: Cladonia sulphurina is morphologically similar to C. deformis in that both have yellowish, elongate, sorediate, cup-bearing podetia. But C. sulphurina contains squamatic acid (UV+, no crystals on surface), while C. deformis contains zeorin (UV-, needle crystals on surface). In most cases C. sulphurina is easily distinguished by its brighter yellow color, the presence of uncupped podetia and irregular, split cups and podetia. 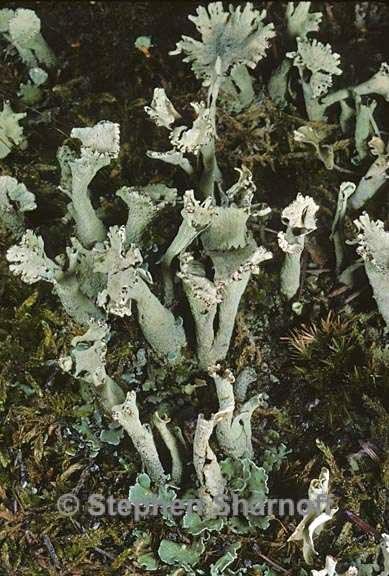 Cladonia deformis is actually less deformed than C. sulphurina (e.g., Goward 1999).